my.trading.space: August 23 - What's with the Foreign Fund Outflow? 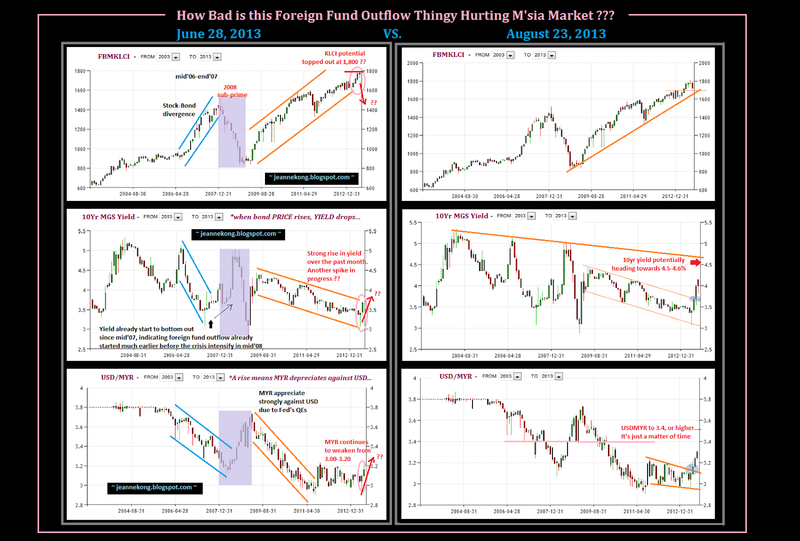 August 23 - What's with the Foreign Fund Outflow? Ahhh...new post for the week of August 19-24, 2013. Anyway, here's the link to the photo album for August 2013 posts on the page. Remember we discussed the potential bottoming out of USDMYR & MGS 10Yr-yield, all the way back when we close 1H 2013? The simplest thing to do to assess how bad this 'FF outflow' thingy is affecting Malaysia markets, that includes all three equities, bond, & currency market, is to put a side-by-side comparison of the 3charts, June28 vs. Current. A quick sneak peek here....Also, its available on the FB Page, of course. And then, I have the usual Favorite Trio analysis for FKLI, FCPO, & Gold, as of end of August 23, 2013. FKLI, hammered by foreign fund outflow, is definitely setting s bearish tone. CPO, on the other hand, buoyed by weak MYR, has been rising >100pts over the past 2 weeks, & still running strong as of Friday, August 23 close. Might see slight pullback/stall, before it continues its run towards the inverted H&S target of 2,400-2,420. GOLD, on a double bottom breakout run-up, has been lifted further to end the week at high of 1,397.40, right below 1,400 mark, after a huge rise in jobless claim (due Thursday, Aug 22) + surprise 13% plunge of new home sales (due Friday, Aug 23).